Some people have a tendency to gloat when they accomplish something or when they prove someone else wrong. Others are much more modest and don’t like to gloat, even when they have accomplished something impressive. 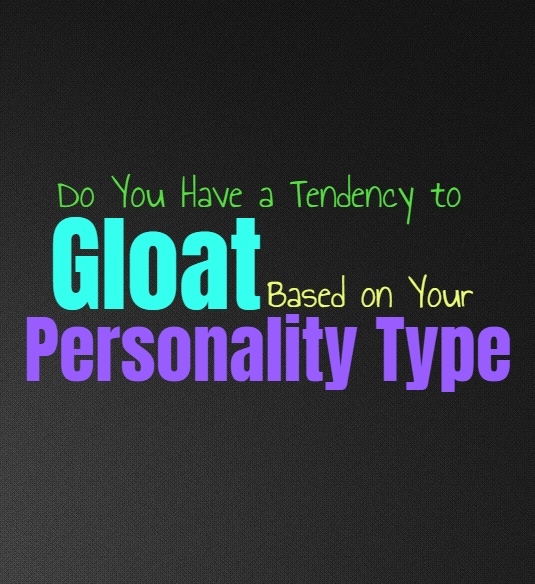 Here is how likely you are to gloat, based on your personality type. INFJs often try to keep themselves from gloating too much, but at the same time they don’t like to be wrong. If they have argued with someone who has tried to act superior to them, then the INFJ will enjoy being able to gloat a bit. They do sometimes find themselves to be prideful people and so they don’t like being seen as wrong about something. INFJs will sometimes gloat when they are around people who they feel try to act superior, and in these instances they don’t mind being seen this way. When it comes to loved ones though, the INFJ usually tries not to alienate them or gloat in a way that might hurt them. ENFJs do sometimes find themselves gloating over their accomplishments, mostly because they want people to recognize them. They don’t really like when someone doubts them and so if they argue about a subject and can prove themselves right, they do sometimes like to gloat. ENFJs can be stubborn people at times, especially when someone is challenging them and trying to make them feel foolish. In this case the ENFJ is likely to gloat a bit when they can prove themselves. INFPs don’t really like to gloat and most of the time they just like having people who can be proud of them. For the INFP it isn’t about gloating and being boastful about their achievements, instead they want to see the people they love be proud of them and what they have done. They enjoy connecting to these loved ones and seeing them truly be amazed by their actions. INFPs do however gloat when someone has been pushing their buttons and trying hard to make them feel inferior, in these cases they do often unload on this person. ENFPs do sometimes like to gloat about things, especially with someone who they feel challenged by. If someone continues to push the ENFP or argue with them, then they often want to gloat when they have proven this person wrong. ENFPs are definitely the type to say, “I told you so” and so they don’t mind gloating around certain people. For the ENFP it is often dependent on their surroundings and the situation, but they do have times when they gloat a bit about their achievements or simply when they are right about something. INTJs are definitely the type of people to gloat about things, mostly because they enjoy being right about things. When someone challenges the INTJ it feels good when they can prove themselves right and show their intelligence. For the INTJ being able to share the correct information is rewarding for them, but they do sometimes appear to gloat about their accomplishments and achievements. For them it isn’t really intended to be gloating, but for the INTJ it is something which happens naturally. ENTJs do have a tendency to gloat when they have achieved something impressive, or when they are right about something. If the ENTJ has argued with someone and is capable of proving that they were correct, then they do like to gloat a bit. For them it feels good to have won, but they don’t mean for it to be hurtful or insulting. For them it is about taking on the challenge and being able to prove to themselves that they are knowledgeable. ENTJs also enjoy being proud of their accomplishments and sometimes it can seem like they are gloating. INTPs do sometimes gloat when they have gotten into a debate with someone. They take on these challenges but at the same time they do enjoy proving themselves right. Sometimes INTPs gloat simply because they are around people who push their buttons and so they feel the need to be a bit boastful towards that person. INTPs don’t really like being wrong about things or having people who doubt their intelligence, and so they do sometimes gloat because of this. ENTPs do have a tendency to gloat about things, especially when they have gotten into a debate over the subject. They do enjoy being able to prove themselves right, and so sometimes they gloat in these situations. ENTPs do like to challenge themselves and others, wanting to learn more and uncover just how much they already know. For the ENTP sometimes gloating is just for the sake of being amusing or even pushing people’s buttons. ISTJs don’t like to gloat too much, especially if it will alienate people from their lives. For them it depends on the situation and if gloating feels necessary. ISTJs try to remain respectful and focused on their own business, but there are times when gloating just comes naturally. When they have gotten into a serious argument but know they are right about something, the ISTJ is likely to gloat when they can prove themselves right. If they are in a work situation where someone continues to demean them, the ISTJ is likely to gloat when they can prove themselves superior to this person. ESTJs do sometimes gloat, since they enjoy being proud of their accomplishments. They are likely to gloat around people who have doubted them or tried to make them feel unworthy. ESTJs are strong-willed people who go after the things they want, and anyone who tells them they can’t do this is certainly going to witness the ESTJ gloating once they do. They also have a tendency to gloat when they can prove someone else wrong in any situation. ISFJs try not to gloat and prefer to be humble with most things. They don’t want to behave in a way which alienates their loved ones and so for the ISFJ gloating is a bad thing. They do have moments when they are around people who push these buttons and this does drive them to gloat a bit. Most of the time though the ISFJ prefers to be more subtle with the way they express a sense of pride in their accomplishments. ESFJs don’t like to gloat often since it can cause their loved ones to be angry with them. ESFJs want to be liked by the people close to them and so they don’t want to alienate these people. There are times when the ESFJ does feel like gloating though, especially if someone has truly pushed their buttons. They are likely to gloat when someone has challenged them and tried to make them feel dumb about something, and so in this situation the ESFJ will enjoy gloating when they prove themselves right. ISTPs don’t mind gloating sometimes, especially when they are proud of themselves. When the ISTP has proven themselves right about a subject it can feel good to gloat a bit. They don’t really care about how others perceive them in this situation, but for them it is more about feeling a sense of personal pride. ISTPs also care about spreading the truth and sometimes they can appear to be gloating with how they search to prove their point. ESTPs do sometimes gloat about things, since they enjoy being right. When someone challenges the ESTP and they don’t have their facts straight, the ESTP is likely to work hard to prove that person wrong. Once they do prove themselves to be right, the ESTP can certainly enjoy gloating about it. They have a strong sense of pride and really don’t like when someone acts as if they are wrong about something. ISFPs don’t really like gloating and prefer to keep their thoughts to themselves most of the time. When the ISFP is likely to gloat is when someone has talked down to them and made them feel inferior. When someone does this to the ISFP they do enjoy proving themselves right and will likely gloat in this situation. Most of the time though, they don’t feel a strong need to gloat or be prideful. ESFPs are outgoing and often gregarious people, and so sometimes they do find themselves wanting to gloat about things. They don’t do this to be rude or obnoxious, they just enjoy when they can express a sense of pride in their own accomplishments. ESFPs are especially likely to gloat over someone who has challenged them or tried hard to embarrass the ESFP or their loved ones. They don’t like dimming their own light just to make someone else feel comfortable.